These muffins were quite tasty. I’m a big fan of olives, but didn’t find these to have an overwhelming olive taste (so if you don’t like them, don’t be scared; if you do like them, you might add some extra). Preheat oven to 375°F. Grease muffin pans and set aside. In a large bowl, combine flour, cornmeal, baking powder, and salt. In a separate bowl, beat the milk, olive oil, and eggs with a whisk until well mixed. Pour the wet mixture into the dry ingredients and stir until ingredients are just combined. Do not overmix! Gently fold in the olives and tomatoes. 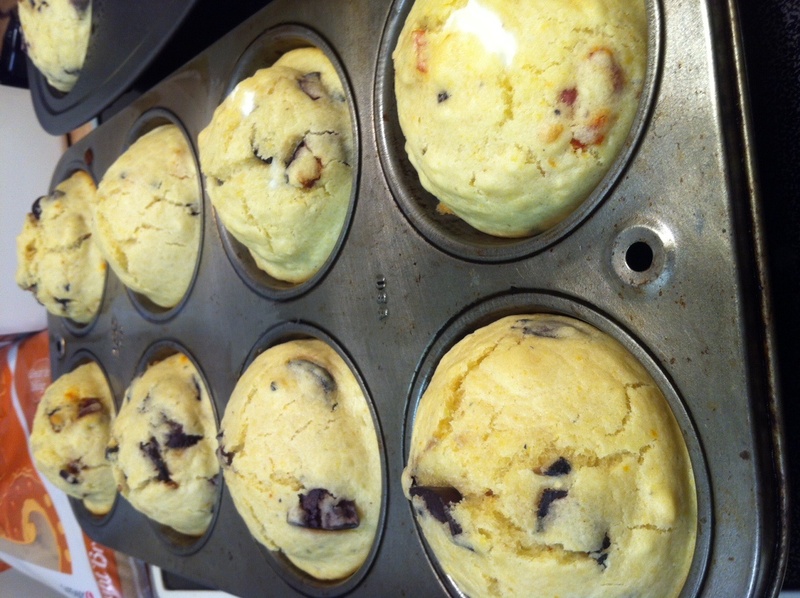 Fill muffin cups halfway, place goat cheese ball in center, then spoon more batter over the top until muffin cups are full. Bake in the center of the oven for about 15-20 minutes. A toothpick inserted into the center should come out clean.